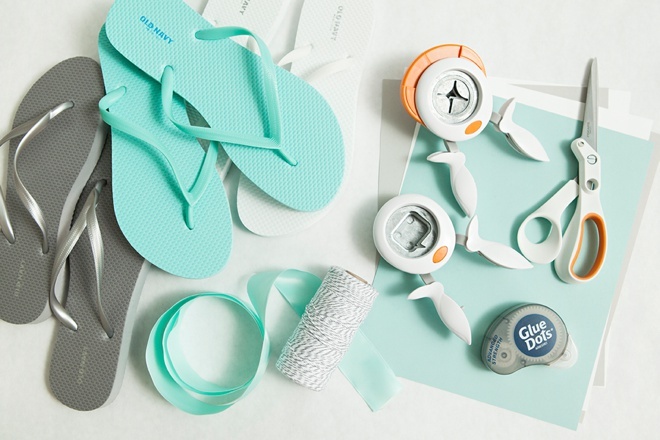 How-to DIY Your Own Wedding Flip Flop "Dancing Shoes"! Happy DIY Wednesday!!! Wait… what? It’s not Friday. That’s right… you guys are in for a treat! 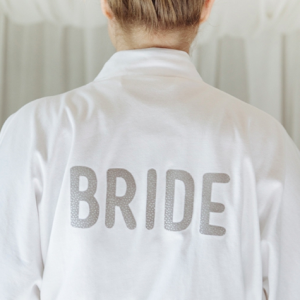 I am thrilled to announce that over the next 6 weeks, I am bringing you a special DIY series inspired by our real DIY weddings! 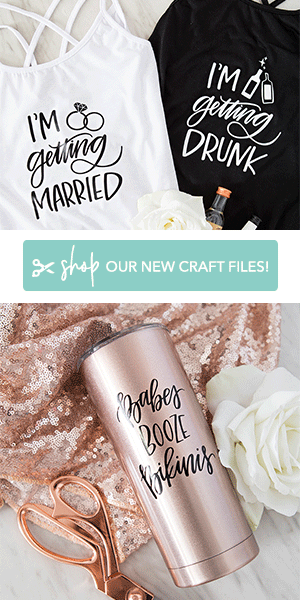 For these 6 projects, I’ve teamed up with Fiskars to bring you tutorials inspired by some of the amazing DIY weddings in my archives!!! Ok, I know I’m over using exclamation points but I’m super excited! 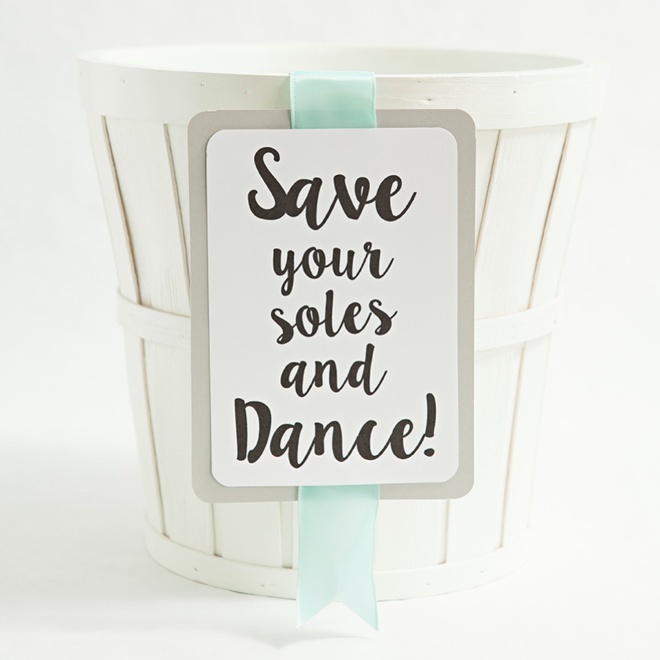 First up, how to make an adorable basket of Wedding Dancing Shoes, aka. 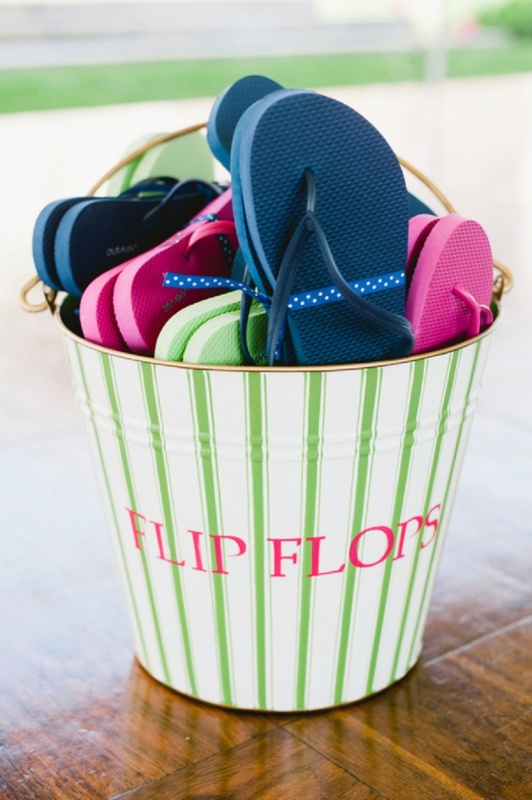 flip flops. All you need is a few simple tools and my free downloads below to get started! Happy Crafting! 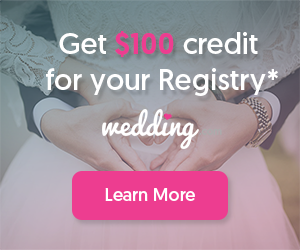 The first inspiring event I’m flashing back to is the gorgeous hot pink and navy blue wedding of Mike and Erin, photographed by Kate Connolly Photography with Off Beet Productions. 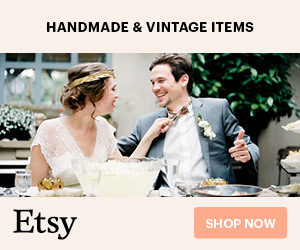 They created a few awesome projects themselves and the rest they had personalized for them by awesome Etsy sellers – which you know we love! 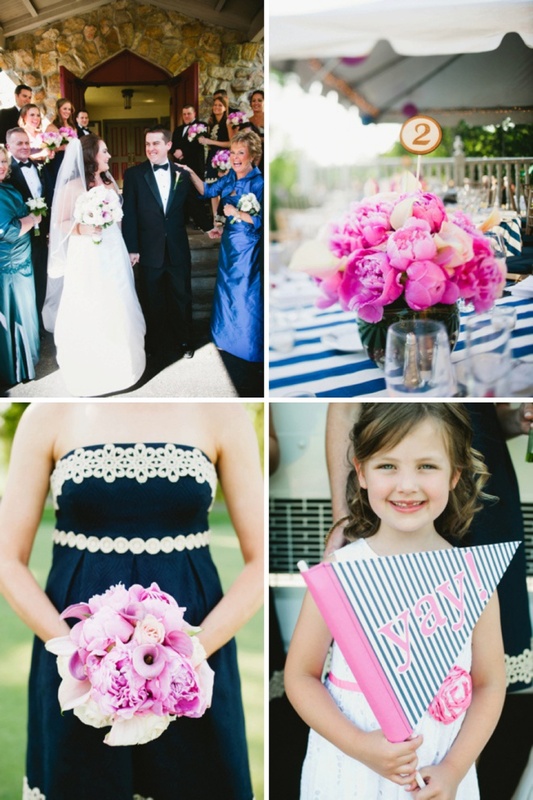 Stop by this blog post to see the rest of their colorful day! 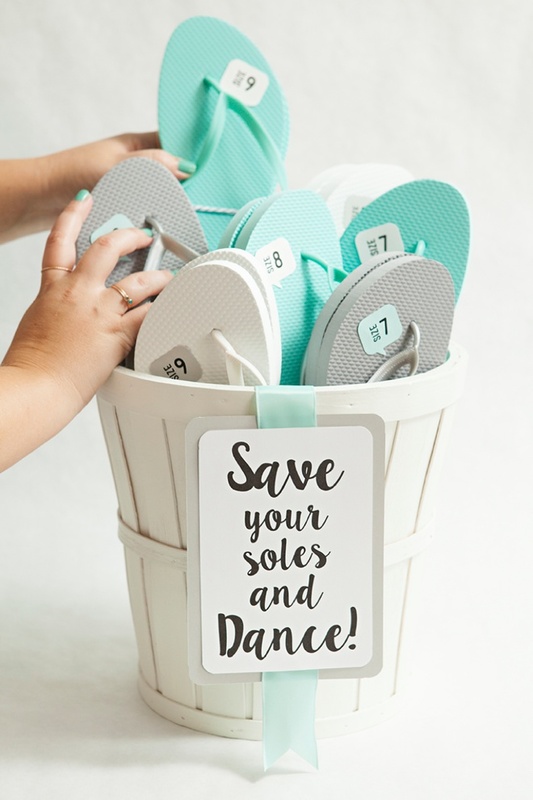 I fell in love with Erin’s colorful flip flop “dancing shoes” basket the moment I saw it… so today’s DIY project is my personal twist on this awesome idea. 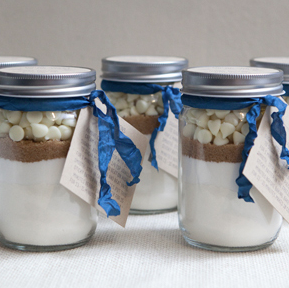 Really, this is such a sweet element to provide for your lady guests – their feet will definitely thank you! 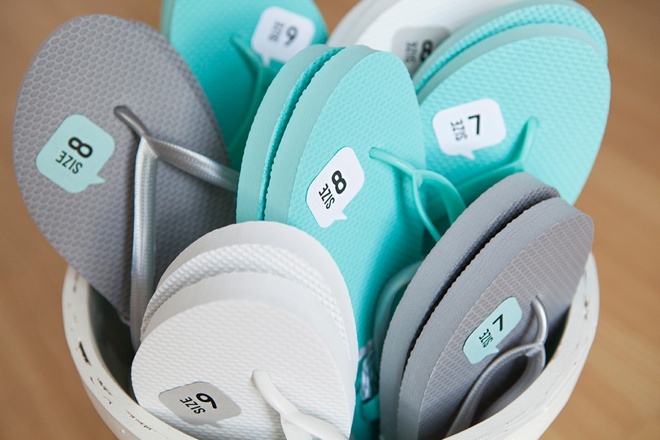 How Many Flip Flops Do You Need? Who will need to relieve their tired feet? 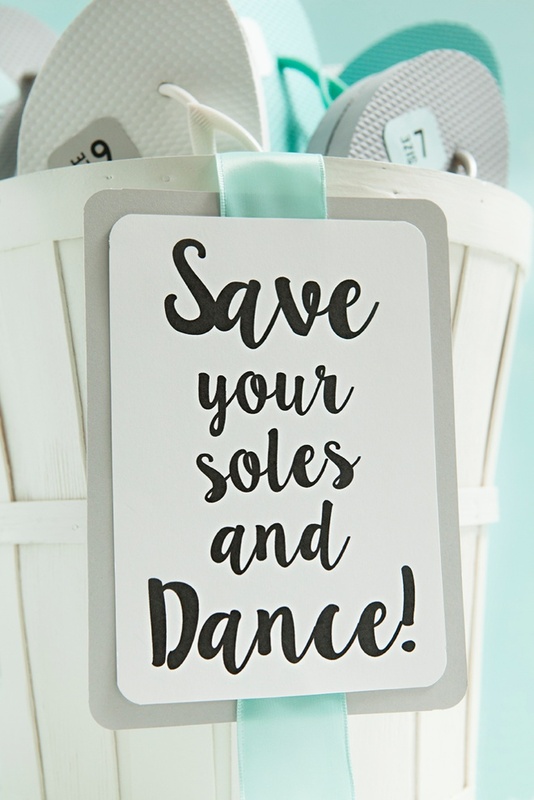 Your guests wearing high heels, so women… ok and maybe that one silly groomsmen that just wants to wear them. 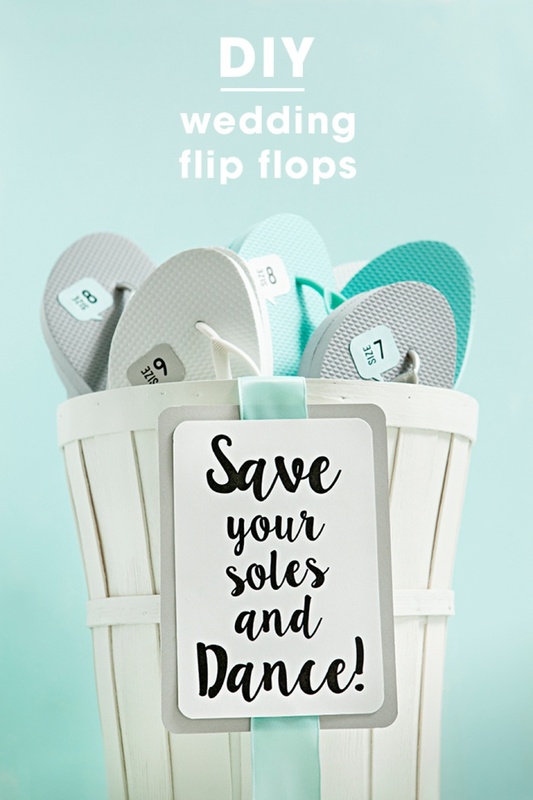 My advice is to divide the number of your women guests in half and buy around that number of flip flops. Not every gal will want/need to take off her shoes and you don’t want to lug 30 flops back home with you. 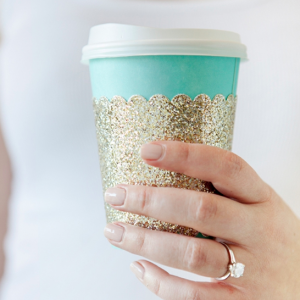 If there are a bunch left over, encourage your bridesmaids to hand them out to your lady guests at the end of the night! 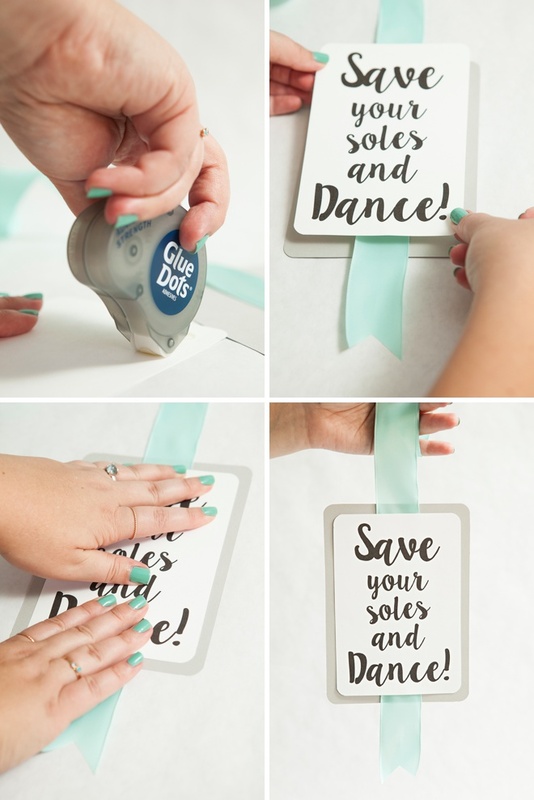 At the end of the post you will find two free design printables; one for the “Save Your Soles And Dance” sign and one for the “shoe sizes”. Download each and print onto 8.5″ x 11″ cardstock – remember when printing click to choose “print actual size”. Cut the sign out along the lines provided; cuts to 4 1/4″ x 6 1/4″. 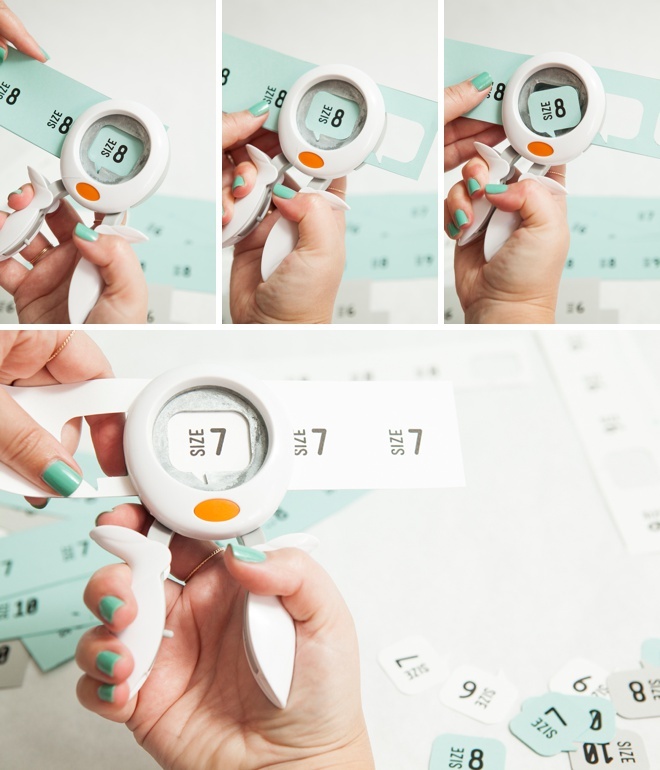 Using the 3-in-1 Corner Squeeze Punch from Fiskars, choose your favorite rounded corner design and punch! I love that this punch has 3 sizes within one; a great multi-tasking craft tool. I mounted my sign on a piece of gray cardstock; measure and cut a piece of cardstock to 5″ x 7″ and then round the corners just like you did in the last step. To be able to hang the sign over the side of the bucket, add a piece of ribbon running down the middle of the sign with Glue Dots. Next, adhere the sign design right on top of the ribbon. Cute and simple! 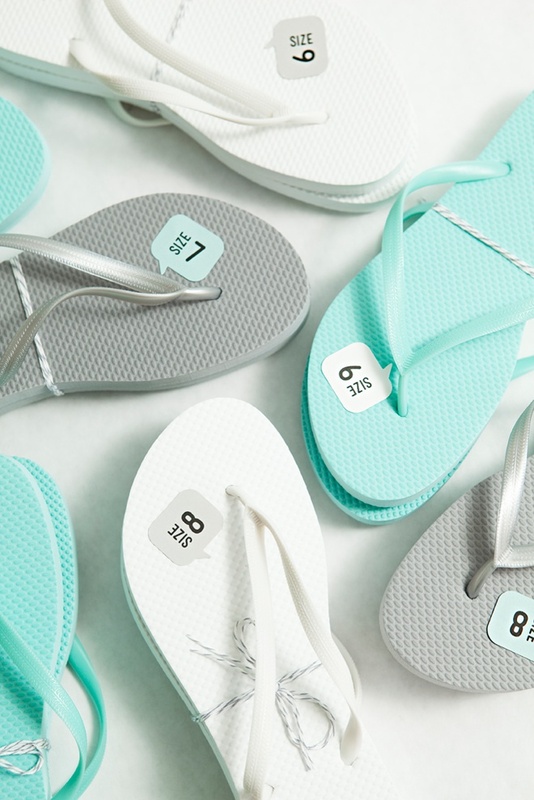 Next up, the shoe sizes! 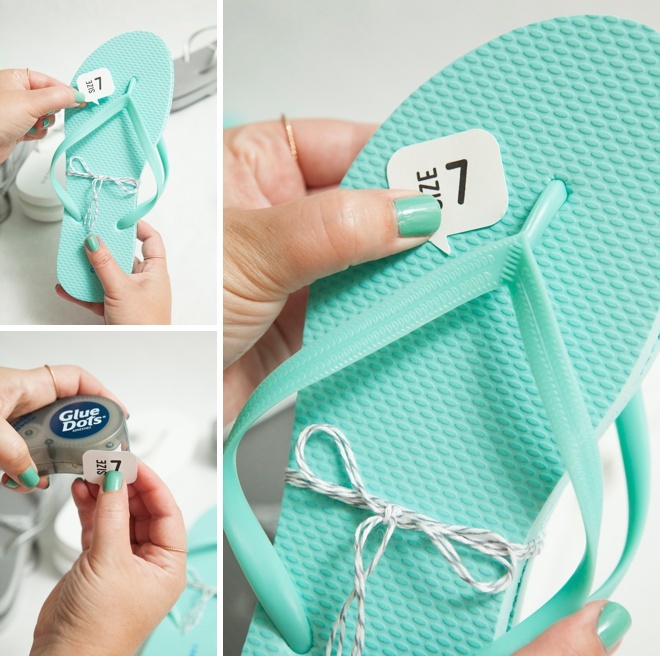 Since you will be taking the tags of each pair – you’ll need to communicate the sizes to your guests – and this is the perfect way. 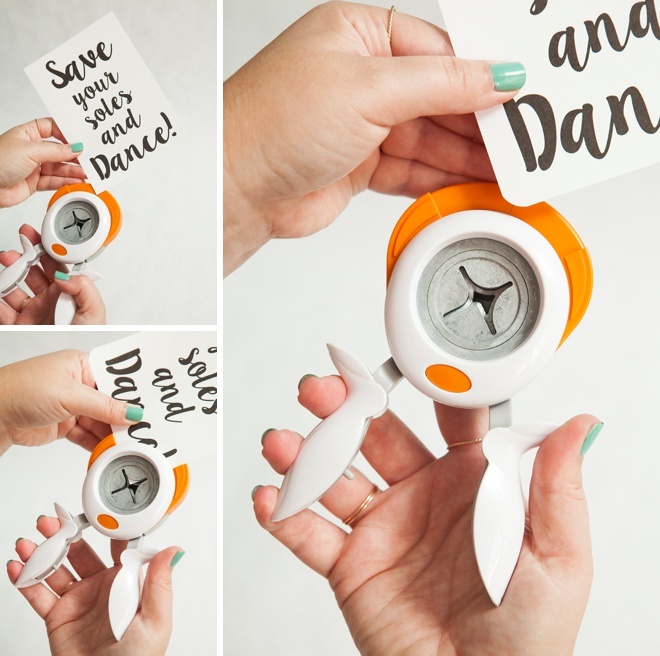 I’m dying over this “word balloon” punch from Fiskars – isn’t it adorable!? I’ve designed the printout to work specifically with this punch. 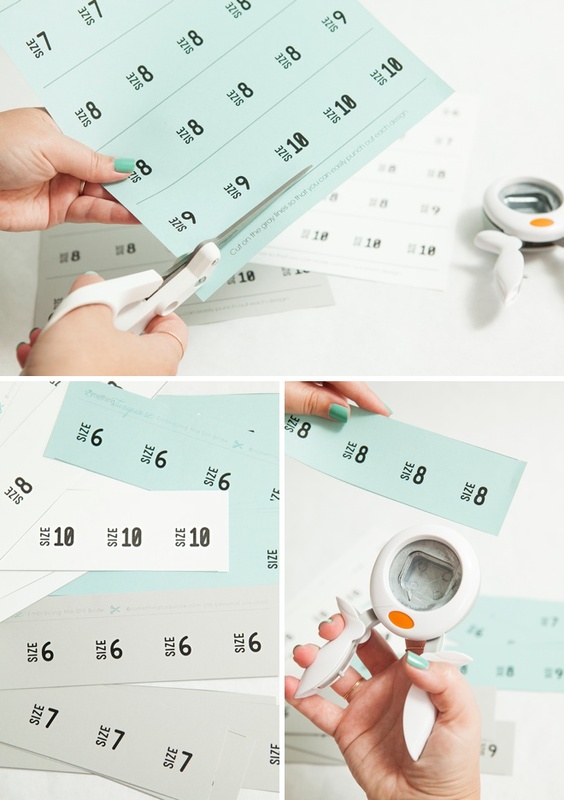 Cut on the lines provided, this makes the best use of the paper to punch out the designs. Using the squeeze punch, center the design and squeeze – that’s all there it to it. 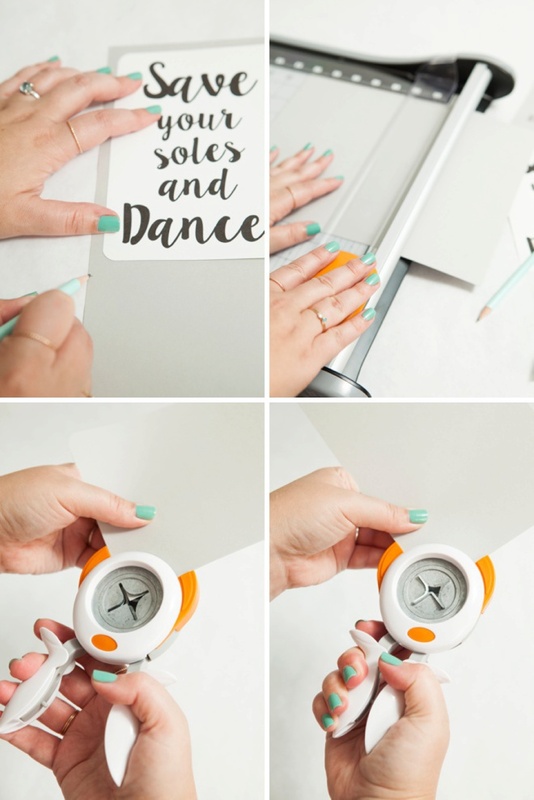 I’m a huge squeeze punch fan because they are super easy on your hands. Punch out all the sizes you are providing. 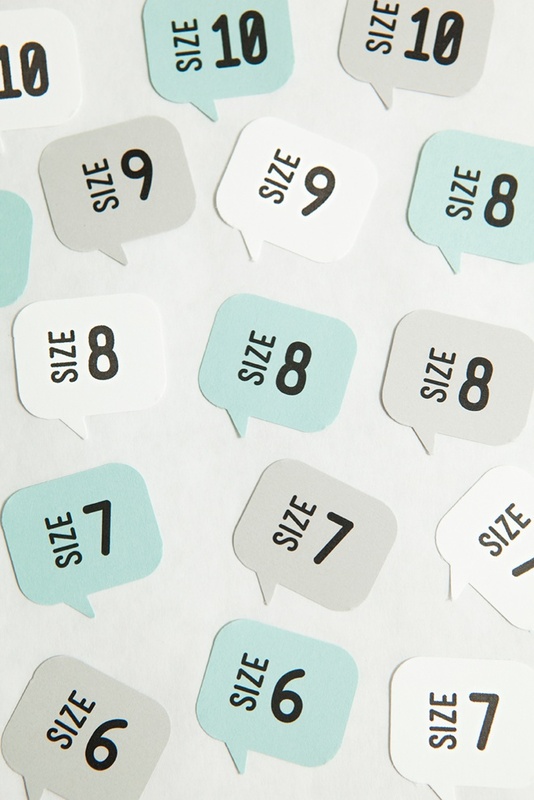 Of course size 8 is most popular, but so is 7 and 9… so do your best to provide a range of size options for your guests. Tie each pair together tightly with ribbon or twine, so they don’t get mixed up. 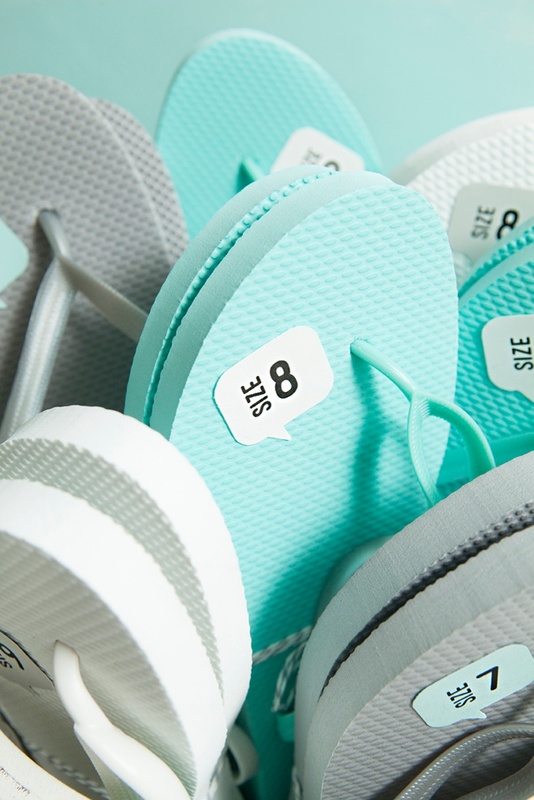 Using a Glue Dot on the back of each size bubble, adhere them to each flip flop. 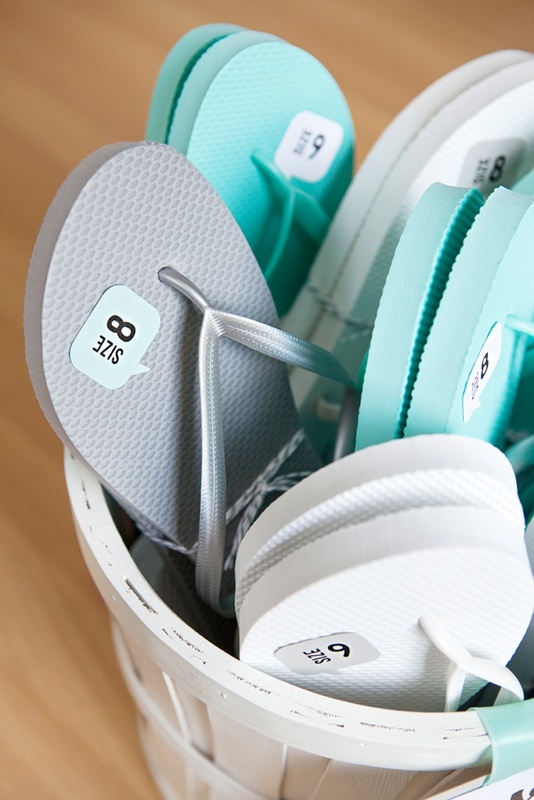 To make things easy, cut the tags off after you’ve added the size to each pair. Adorable right? The Glue Dots say “advanced strength” but they pull off each flop like a price tag. I picked up this adorable bucket from Ikea, but you’ll need one that will fit all your shoes. Using packaging tape (the clear shipping kind) I firmly taped the ribbon inside the bucket so the sign would hang on the outside. 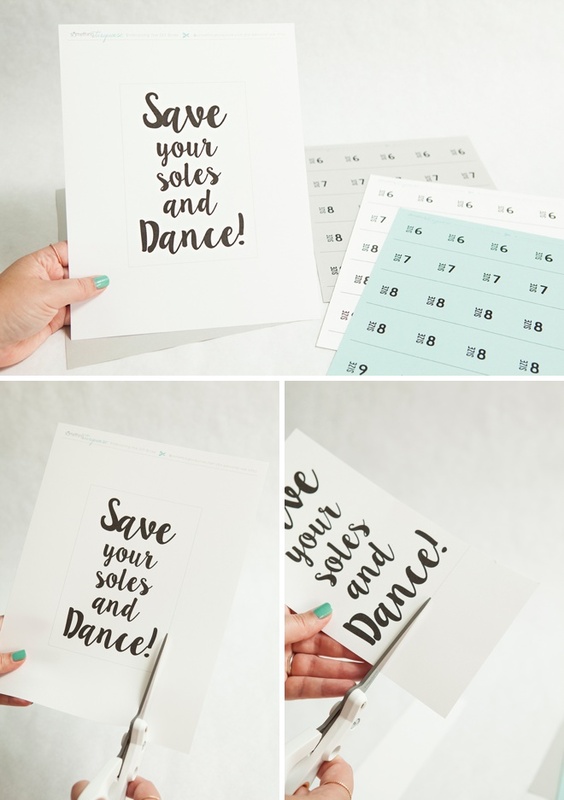 Save Your Soles And Dance! 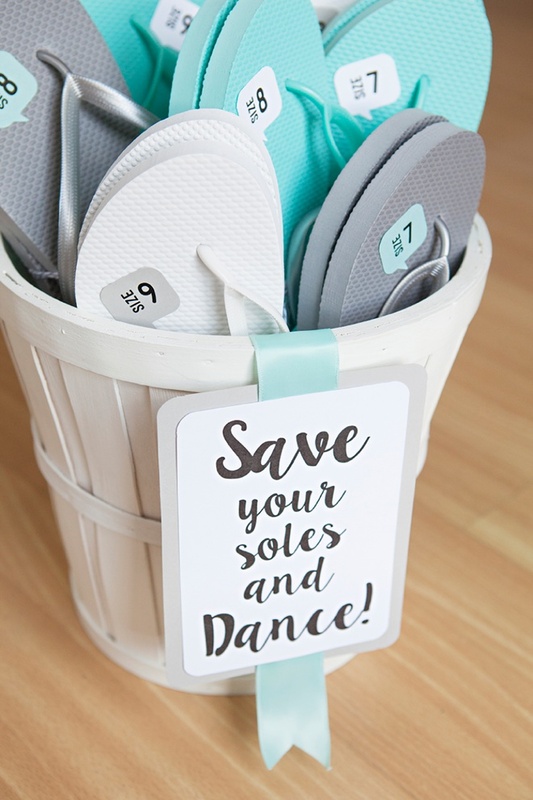 Place your flip flop bucket right on the dance floor… so that there are no excuses! Tell your DJ that these shoes are available so he can do a few shout-outs to get everyone up and dancing – even if their feet hurt! 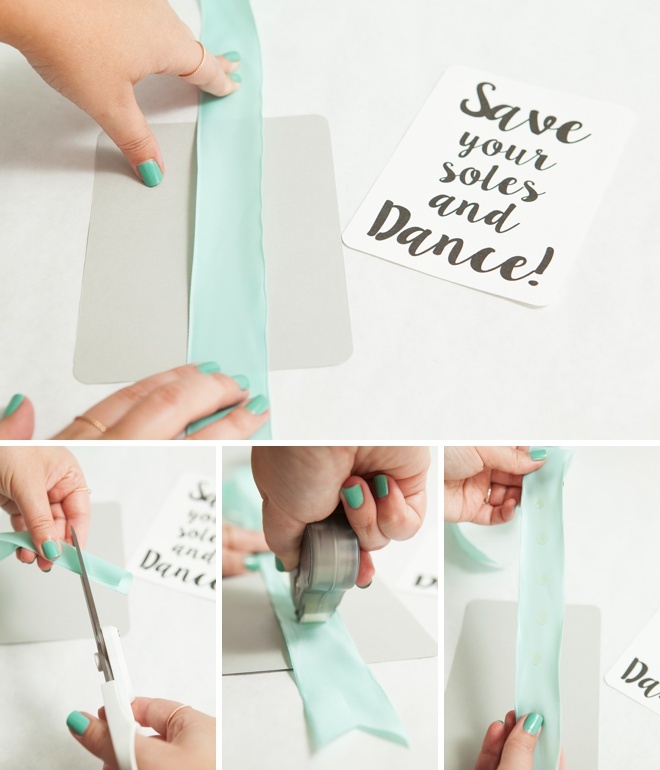 I’m so excited about how this project turned out and I hope that I’ve provided some real life inspiration on how to take an element that you find in a wedding and turn it into an awesome project of your own!